Is it a fault: penetrate under the net when the feet are completely in opponent's space, but not on the court? 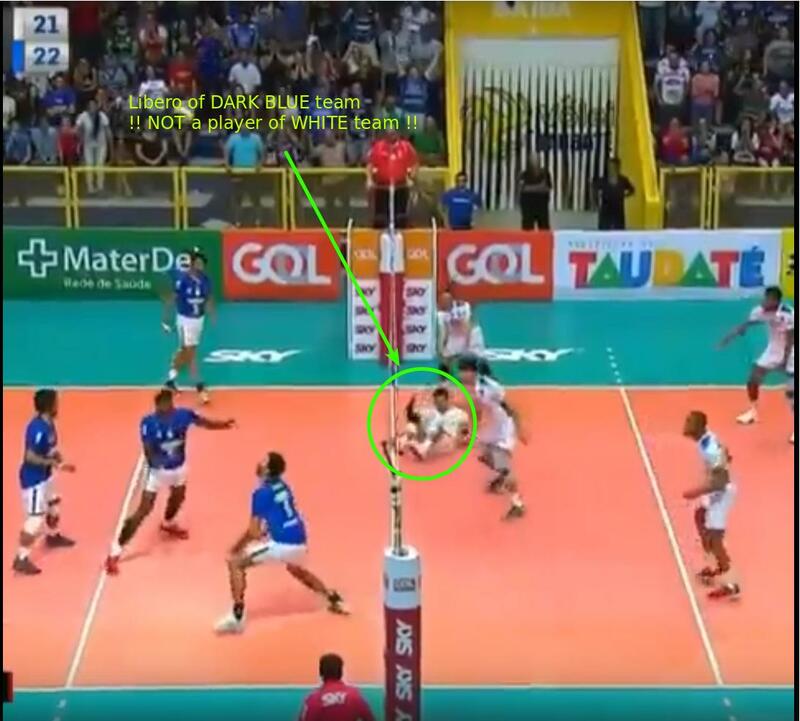 Libero of Sada Cruzeiro flew to the opponent's side but didn't touch the court with his feets. At the same time, his feet were in the opponent's space completely. 11.4.3 A player’s foot (feet) penetrates completely into the opponent's court. So, the question is: Am I right, that in the considered case libero didn't penetrate into the opponent's court? There could be other errors, but the main point of the question is libero's feet: they are in the opponent's space (assume, they don't touch the court). Is this a violation? The libero's feet do not touch the opponent's court as he is playing the ball, and he is careful to move his feet back over the centre line when retreating to his own side. Hence, there is no violation of 11.2.2.2 in this instance. This is a judgement call on the part of the first referee. In this example, the first referee is a professional referee and I'm not, so you should probably trust their judgement more than mine (the play was not called a fault). Not the answer you're looking for? Browse other questions tagged rules officiating volleyball or ask your own question. When can you lift your pivot foot and go for a shot? Can a sumo wrestler touch the ground before his opponent in the act of forcing him to the ground? Is an own goal scored with hand a valid goal? Shuttle touching the floor of the court is not a fault? What does the ITF rulebook consider to be “the service motion”?